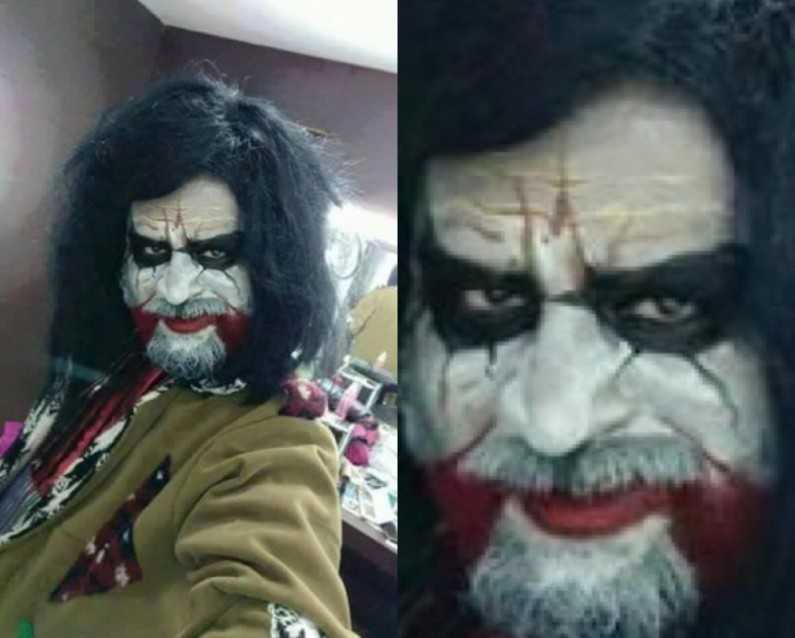 Rajnikanth’s joker-look profile, purportedly a character in his upcoming movie Kabali, leaked to the social media is creating ripples of excitement amongst his fans. The picture, reportedly a selfie taken in the course of the shooting, is rocking the social media sending his fans into frenzy. The formal inauguration of the shooting for the highly hyped up next film of the Southern Superstar is due to be held in a couple of days. And the unexpected leak of a joker-look of Rajinikanth is rapidly setting the social media on fire. There are rumors floating around in the media that the picture is from Kabali, Pa. Ranjith-directed next Rajini-film. The shooting for Kabali is scheduled to start on September 17 on the auspicious occasion of Ganesha Chathurthi. The leaked picture shows Rajinikanth’s heavily made-up face resembling that of a joker. Seeing the image, the already excited fans are eagerly looking forward to the Superstar’s character and role in Kabali. Other actors set to play critical roles in the movie include Radhika Apte (of Ahalya fame), Prakash Raj, Kalaiarasan, Dinesh Ravi and Dhansika. The film is produced by Kalaipuli S Thanu and the music is being scored by Santhosh Narayanan. While initially it was rumored that most of the shooting for Kabali will take place in Malaysia, sources from the film unit now confirm that the Malaysian shooting schedule has been shortened considerably and the movie will primarily be shot in EVP Park and Adityaram studios in Chennai itself. Huge and grand sets are being erected for the shoot, reports IndianExpress. Earlier there was another leaked photo of Rajnikanth purportedly in the guise of a Malaysian cop. The film itself is rumored to be based on a real-life underworld don from the Mylapore area in Chennai. Rajini is reportedly essaying the role of the don too. Multiple rumors about his role and character combined with photo leaks are creating added excitement to Rajnikanth fans as they wait with bated breath to see their idol recreate his famed style in Kabali.